As a project at college, my class is tearing down 4 (BRAND NEW) Chevy 350 engines, and will eventually reassemble and ultimately run them, although one group has a 305. My group's engine was painted gold, the intake ports and the timing cover worked well as percussion instruments. We put a threaded rod with a couple bolts to act as an easy way to rotate the engine, This eased a lot of things, like the removal of the valve tappets, or lifters. We also launched a few of the little plugs that were there to protect the spark plug hole, today I was almost hit by another group's plugs, but it shouldn't hurt as bad as a paintball. The past two weeks comprised of my group and I carefully dismantling the engine, which is a flat tappet pushrod engine with a 350 cubic inch, or 5.7 litre displacement. It was also the base of the infamous 4.3 litre V6 engine, commonly found in the mid 90's S10 and Blazer. 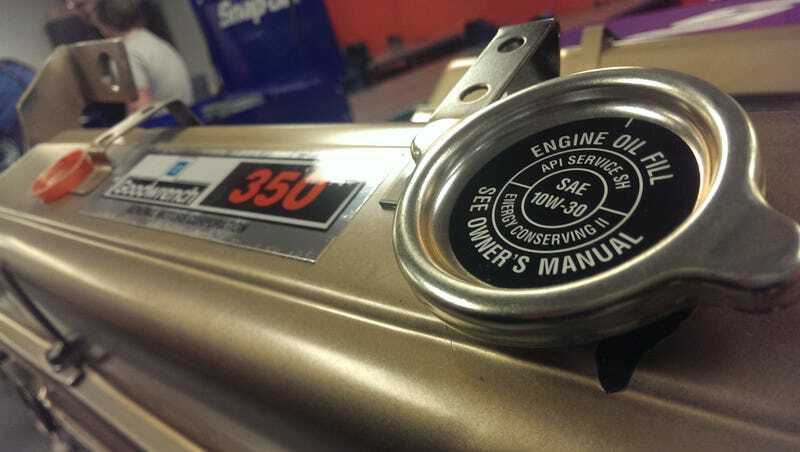 The engine is a brand new long block crate engine, without an intake installed. It will use a carburetor, instead of injection. This week, we managed to take the heads off the engine, hence why we "beheaded" it (lame pun, yeah yeah.. I know). If you look closely, you can see a cross-hatch pattern in the cylinder walls in the image below. We sorted all the lifters, rockers, pushrods, into separate bags, if there wasn't a spot on our tray.